Blake Hunter Armes | Families for HoPE, Inc.
As a veteran of Desert Storm and serving in Saudi Arabia as a nurse, Marki Armes of Scottsboro, Alabama, knows about challenges. 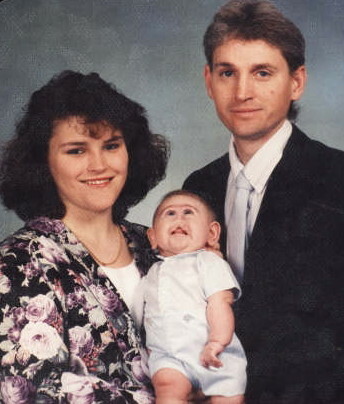 On January 30, 1992, Marki and her husband, Tim, became parents to their first-born child, Blake Hunter Armes. 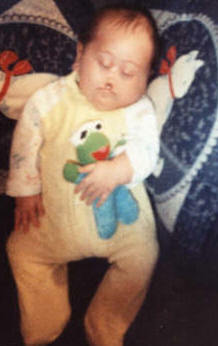 It was quite a surprise to discover that Hunter was born with a bilateral cleft lip and palate and a small nose. As a result, he was transferred immediately to a large medical facility in Birmingham. Hunter was born by c-section, so Marki was unable to go with him for the first two days due to complications from her surgery. With a broken heart, she thought, “I have waited all this time to see him, and they didn’t even let me hold him”. 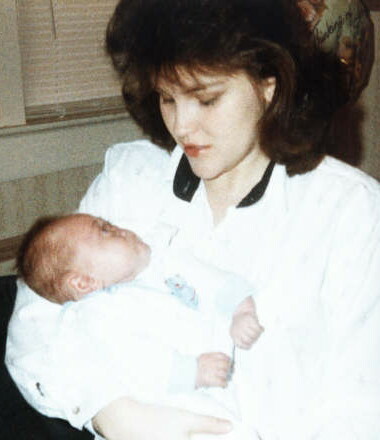 Tim stayed with Marki that first day while both sets of Hunter’s grandparents went to Birmingham to be with Hunter. The next day, Tim joined the grandparents in Birmingham to learn more about Hunter’s medical condition. Still hospitalized in Scottsboro, Marki was trying to make sense of it, thinking to herself, “Why did they rush him to Birmingham so quickly? I know he has a cleft palate, but surely the doctors at this hospital have seen that in other infants before.” Within hours, she would learn the reason for the doctors’ urgency and the challenges facing their family. Marki’s parents returned to her bedside that evening to deliver heartbreaking news. Marki remembers, “My mom and dad came back that night and could barely speak. I thought, ‘He has some kind of brain damage. That’s okay; I will just be at home with him for the rest of our lives. That’s okay; I can do that.’” As a trained nurse and a new mom, Marki was ready to face the challenge head on. Hunter surpassed those early predictions and went home with his devoted family. He needed a feeding tube for nutrition and hydration, and he struggled with seizures and temperatures at times as high as 105-106 degrees. Through it all, Hunter was surrounded by the love and devotion of his family. Tim and Marki had a beautiful six months and nine days together with Hunter filled with devotion and unconditional love. Marki was with him every minute, and she wouldn’t trade those minutes together for anything in the world. What a glorious reunion it will be when Marki holds Hunter in her arms once again! I prayed to the Lord to take control. While our baby was losing the fight. Not deserving to have his life spent. He suffered more and more; we sang lullabies. I didn’t know He would have him go. I finally let God take him home. That little one gave us such joy. I love you Hunter forevermore. I know you are happy with our LORD! I can’t wait to get there to watch you play. ← Keep calm and . . . Your story is a true inspiration.I certainly can relate ! I went into early labour at 28 weeks with twin boys and was told that my first Kiyan had semi lobar HPE. We were given very little hope but I knew in my heart of hearts that he was a fighter and would survive and now he is 15 months and truly beautiful. I am not sure what the future holds but for now i will enjoy and treasure every moment with him!